(CHARLESTOWN, NEVIS–THURSDAY, APRIL 21, 2011) The Premier and Minister of Education in the Nevis Island Administration (NIA), the Hon. 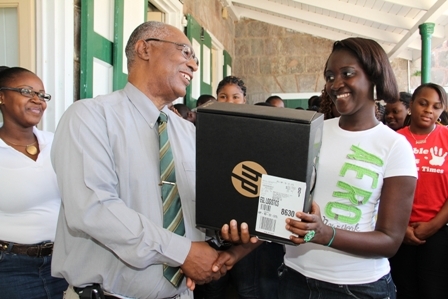 Joseph Parry continued his Nevis Reformation Party led-Government’s demonstration of assisting Nevisian students to excel in Education when he presented brand new laptops to Nevis Sixth Form students on the apron of his Bath Hotel office on Thursday morning. “I want to remind each student how important education is to your families, your community and all of us. 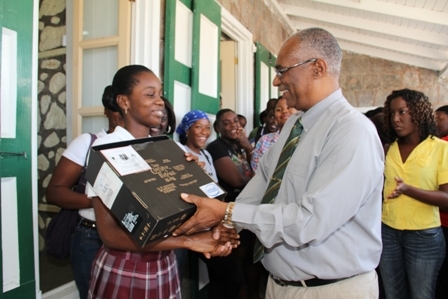 There was a time when going to Sixth form for Nevisian students meant going to St. Kitts, now there are 137 students attending Sixth Form college here in Nevis,” commented the Premier. The Hon. Joseph Parry went on to say that it was sad to know that with the state of education in this global society, some have said that if there were five people in one home there should be no more than two computers. The Premier then asked the students to question the situation and to ponder on how many persons were interested in them and wanted to see them do well. Mr. Parry said that his government had revealed that they are truly interested in young people and their future. “The computers belong to you, it is yours for you to keep and it is not just a symbol but a presentation in terms of opening the doors to a bright future, “said the Premier. “To the people who say the computers are going to mash up, tell them you will care for them. To the people who say it is for a vote, tell them it is for a good vote,” concluded the Premier.